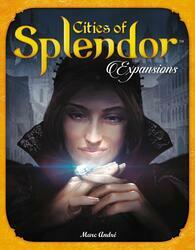 Discover new ways to play Splendor! The Cities of Splendor contains 4 independent expansions for Splendor, the first game of the Space Cowboys: The Cities, The Counters, The Orient, The Bastions. The Cities: New objectives. Each city claims its major work. Make one of them to win the game. The Comptoirs: Powerful powers. Open counters along trade routes and get powerful privileges. The Orient: Unpublished maps. The Indian road leads to unsuspected resources. Learn to master the powers of the empires of the Levant. Bastions: Accelerate your expansion by building bastions and limiting the progress of your opponents. Be careful this game is an extension of Splendor and cannot be played alone. To be able to play it you must have a copy of the game Splendor .